Sarah Fischer, a spring Ohio State graduate, became interested in sustainable international development as a high school student, when she learned that her French teacher’s husband was a former child slave in Haiti. Working with the nonprofit organization that he started to free other child slaves, she learned how deforestation and lack of environmental education contribute to poverty in developing countries such as Haiti. During her time as an undergraduate student, Fischer held a variety of internships related to sustainability and the environment. She was a development intern for the Ohio Environmental Council, an electric vehicle and communications assistant for Clean Fuels Ohio and a sustainability intern for the Ohio State Athletics, Business Advancement and Business and Finance departments. 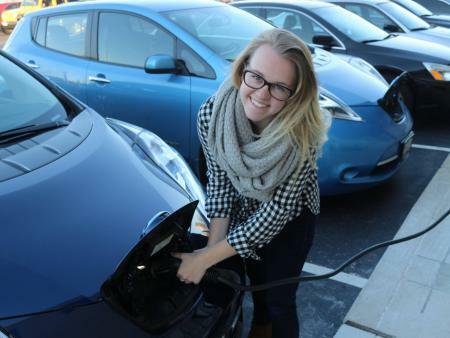 Most recently, she worked for the Electrification Coalition, a nonprofit organization that promotes large-scale distribution of electric vehicles, through an internship with Smart Columbus. She shares her experience as an EEDS student and numerous internships in a spotlight interview. Fischer also served as vice president of events and president of Net Impact, a student organization that focuses on promoting sustainability in business. She was a member of the Time for Change Week planning committee and a School of Environmental and Natural Resources student ambassador. The Women of Renewable Industries and Sustainable Energyawarded Fischer with a fellowship to attend the American Wind Energy Association’s WINDPOWER conference last month in Chicago. This month, Energy News Network featured Fischer in an article about women in renewable energy jobs. Fischer recently began her first post-graduate position as a program assistant at the District of Columbia Sustainable Energy Utility (DCSEU), a nonprofit organization that helps residents and businesses in the Washington, D.C., area reduce energy consumption and save money through energy efficiency. Tristen Spahr is a student communications assistant at the Office of Energy and Environment.